Wendy Dicker liked this on Facebook. People have to stop at some point and take responsibility for their actions. I got sucked into this and ended up paying them £60 to send me some forms with a pre paid envelope. which i couldnt of grab from the post office and telling me to then send 20 pound to DVLA swansea!! It shouldnt be legal and i have ended up paying a total of 80 pounds for my lost license!! I too was taken in and because of not reading carefully enough have lost £72. Regarding Mr know it all above, very easy for you to say that. The reality for a lot of people is that life is just one big rush, it would be nice if we all had the time to pop down to the post office and take our time over these matters but the reality is that we are all working very hard and long hours to scrape a living. I have learned one thing from this that GOOGLE cannot be trusted to make suggestions about business that are behaving well, yes they are legal but morally they are on very rocky ground. So just who can you trust these days ?, VERY DIFFICULT question that one. Thankyou for your sympathy. This simply should not be allowed – innocent people are being conned it’s technically stealing money. The law needs to be changed to protect people!!! I have also been sucked into this and despite what ‘Embolism’ says in his post – when you search for ‘driving licence application online’ up comes this site, you click on it and it immediatley takes you to the apply for a licence and there is no mention whatsoever that they are not the DVLA, the site looks official and is designed to trick you. I parted with £60 and when I complained I was told it shoudl have been £50, later this was retracted and Glenn at this compnay said sorry it was £60. £60!!! for filling in a few lines on a firm which I could have done myself in 5 minute. It’s a rip off but they have covered themselves very well. As for ticking the boxes that say you have read the terms and conditions etc., well truly – who expects that the DVLA will rip you off .. certainly not me. Sorry, but I am with the customer on this one and if anyone want to make more of it I shall be happy to join any group to see that these people are taken to task and at the very least asked to change their website. It is simply not fair to take £60 for this so called service – we need protecting! Not everyone is computer savvy. Is there some official body that we can complain to? Also as I made my payment by Barclaycard and I still have three weeks until it is taken from my account, can I legally stop this payment or would I be putting myself in an illegal position by doing that? Does anyone know? Pressure must be applied to our goverment body( DVLA) for example’, if I were to type a search into a search engine, and was quoted £60 for a service which should only cost only a fraction if anything, is this search, if allowed and accepted by my goverment body, an attempt to abstract money from a trusting and relient public? This concept which the DVLA is endorcing by a submissive attitude will only be seen as corrupt when the full magnitude of their actions are brought to light. DRIVING LICENCE ONLINE is Fame Gate Limited a company registered in Hong Kong (version 3 from June 2013 whilst version 1 and 2 were dissolved). You are directed to a server (managed by crooks) in Hong Kong. They are taking personal and bank information from you. What are the chances of further scams or identity fraud? Would you want these people to have your bank details? My bank today ACCEPTED that they are FRAUDSTERS and have refunded the fee that they have taken from my bank account. They are going through their fraud processes. I’m afraid my son fell for this site. He genuinely thought he was dealing with the DVLA. He went straight to ‘Click here for your licence now’ without reading the small print. He’s 17 and clearly naive. I’ve given him strict orders and I do not permit him to make any payments using my card details without letting me know first. As he thought he was dealing with a government organisation he made an exception in this case. I know not good and he’s been told off. Does anyone know where I stand under those circumstances. I have already emaild the company but no attempts to make a refund yet. On top of it the form came back with the incorrect DOB. I read in some thread that this is not the first time DOB details were incorrect. Made me wonder if this is a deliberate mistake in order to make you phone their premium rate help line. I do hope that companies like this who are duping the young and vulnerable can be stopped. I will certainly try my best. I am so bloody annoyed and feel so stupid that I’ve given these people my money in true faith that the payment was going to the DVLA. I am even more annoyed that there is nothing I can do about the situation. I consider myself a sensible, wise person, but I stupidly let my daughter sort this herself and as many parents would I provided the means to pay for what I thought was the licence. Surely something can be done about this? Cancelled my bank card and will report to my bank’s fraud team as soon as the line opens tomorrow. Should get my money returned, will let you know. Also DVLA ought to do something about this people cos is rly unfair. Can’t get my money back. Sad. Wayhey! I got my money back. Threatened them with the bank fraud team . I have also said I would send my form back….. don’t trust it as far as I can throw it! I fell for this scam too I filled it all in on the website for my daughter who’s 16 as she wants to do her cbt test so she can get to her part time job it didn’t anywhere say that they dobt issue the actual licence so I checked it all over and paid £50 which my daughter paid half of then got documents through from dvla and it said to enclose £50 so I wrote paid online next tidbit and sent documents off, a week later receive all my daughter’s documents back with a letter saying that she didn’t enclose payment and that they see that we paid through a company that’s nothing to do with them and can’t do anything about it! I am mortified that we have been charged £50 for them to fill out a few crosses and send off how do they justify this?? My daughter emailed them and they replied which was a shock to say that they have carried out their job and can’t refund the payment she sent further ones and they basically said that on the homepage it said that they arent part if dvla and we read the terms and conditions but they don’t say that they don’t issue the actual licence so something needs to be done as my daughter’s upset and they have her details! Anybody know how to try and get the money back? Me too. On 18th october my wallet was stolen while in London and I thought it best to start reporting various cards including drivers licence stolen. I googled on my phone and could barely see the details but thought I had successfully informed DVLA, paid (what seemed to be an exhorbitant fee of) £80 and could sit back and wait for my replacement licence to arrive. I only twigged what had happened when I got the completed application form in the post and called their £1.53 per minute helpline and had it confirmed that I had to pay another £20 to DVLA. I thought I was sophisticated enough not to fall for this type of scam but these guys are clever. Why on earth would they think they were doing something of value by taking info I knew was correct and simply printing it into a form – when I could have entered it once into the genuine DVLA site and simply sat back and waited for my replacement to arrive. As far as I’m concerned it cost me over £80 for them to effectively delay getting my replacement licence by 5 days. And they have the front to take the pxxs through their company name!! 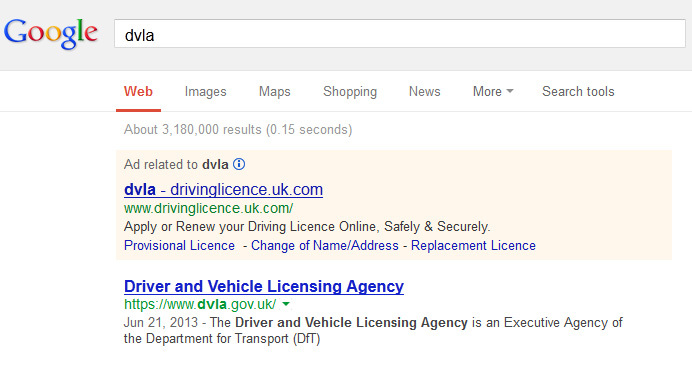 that the real dvla offer for free. This parasitic firm seems to have come to light back in July and still it goes on…my 16 yr old also did a google search, clicked on first provisional licence and paid £50 for what was thought was the licence fee. On realising, I emailed them advising that she was a minor on application and did not have permission to use our credit card for such a service. They emailed back saying that since fraud had been committed with our card we should write to head office, and they would inform the police fraud squad (presumably for us to prosecute a minor for being misled) and once the police had investigated they would issue a refund. I have further responded in writing via recorded delivery, have copied in Trading Standards, the police and BBC watchdog. There is no warning nor clear statement anywhere on their website that they DO NOT PROVIDE LICENCES after application. Perhaps we should ALL simultaneously pay head office a personal visit and invite the national press along to see the anger and frustration this company is inciting ?? I have just found out that the £85 I paid for a new licence is all a scam. Why has this website not been shut down?!?!? I’m an ex student and my financial situation is giving me massive anxiety issues. Is there anyway I can get my money back from these scumbags? I have just fallen into the Scam trap. 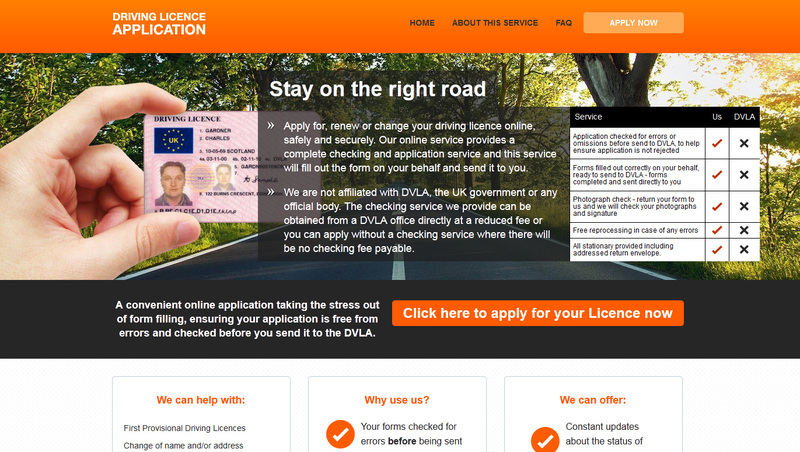 I thought I had applied for a provisional licence for my daughter through DVLA – had never ordered a licence online before only to discover when they sent the completed form back that I had to pay another £50.00 for the licence and the money I had paid was for their checking service. Is there anything that I can do? I have written to request a refund….. but I’m guessing it will be a negative outcome..
No refund can be issued for the appclaition made as the service has been completed, before you actually submit your application we have a section on the payment screen which advises that you need to read the terms and conditions and to also state you agree to the no refund policy, you will have agreed to this before continuing to make the payment and as this was agreed we can not refund any fee paid. Further update: I was offered 50% refund of the £50.00 fee paid – after I said I would report them to the Bank Fraud Team. I hope this helps someone else. I’ve just been scammed £85 as I applied to re new my licence that I need in a bug hurry, only to be delayed by these criminals as they have taken money that I can not afford and over a week later send me the DVLA addressed envelope to submit the £20 00 legitimate fee for the renewal ! How can the GOV.UK let them get away with it by listing beneath these fraudsters when looking on line for the legitamate DVLA.GOV.UK site ? Further more- they made a mistake on my application form and when trying to contact them to correct it,they left me hanging on a bogus premium rate phone line held in a queue that doesn’t reduce therefore paying premium rates. This is not just sharp practice – it’s clearly an attempt to access your bank details. They offer a refund to get your bank details out of you when you have provided them quite a bit of information. Please cancel your card if you have fallen with for this (as I did). You may need to change passwords because the site asks you for a password (which of course may be one you sue frequently). I got email which had a link on it saying click here to report an error or mistake, it is an untrusted connection. So I have messaged them to say under no circumstance debit my card as this is a scam and I want confirmation that all my information has been destroyed. I am really annoyed as a disabled person it was easier to do it online and I was ompletely misled so as for the comment above saying it is my fault, I disagree and would ask you to point out where it says they are not affiliated. Just got suckered for £1. Completely my own fault. They can keep the money. I just hope that’s the end of it. Has anyone had any continuing problems? Yep, never thought I would join the Que..but they had me…don’t just assume they take the £1..2 months later they take a further £24 and more..cancel the card. I never saw anything that I was agreeing to a subscription or further payments? I to have just applied, and as soon as I read the disclaimer I realised that I had been ripped off. £ 60 straight out of my hard worked earnings. I’m off to the bank tomorrow to claim a bank fraud against these rip off merchants. If I were you then you should do the same. Some people are proper stupid cunts. I was stupid enough to fall for this ridiculous scam, and thought I would receive a provisional drivers license also. However I’m not sure whether I should cancel my card or not?